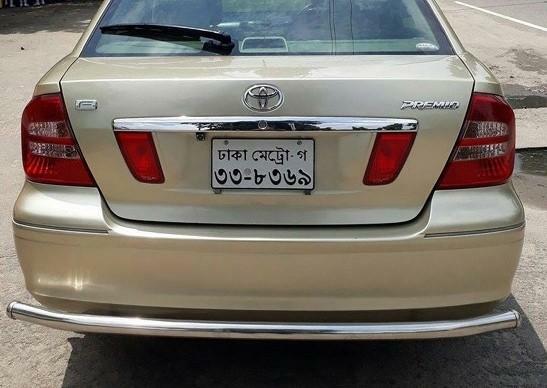 how to extract the given type of number plates and the characters ? 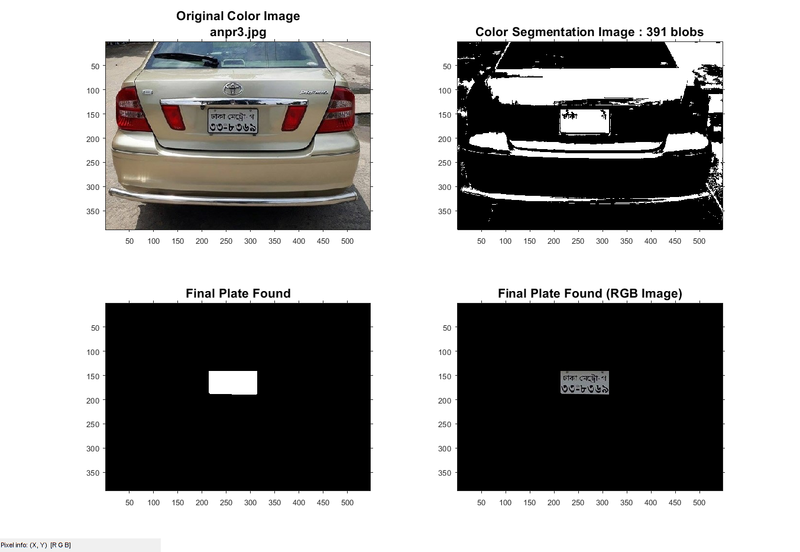 I am working on license plate recognition, but I am stuck on how to develop the code for extracting or localizing the rectangular shape of a number plate from the car image . Try the code below. It works for the given image. You'll need to adapt it to handle cars of different colors and different size plates, but at least this gives you a start on the idea. % Get the name of the image the user wants to use. % Check if file exists. % The file doesn't exist -- didn't find it there in that folder. % Check the entire search path (other folders) for the file by stripping off the folder. fullFileNameOnSearchPath = baseFileName; % No path this time. % Still didn't find it. Alert user. % Read in demo image. % Get the dimensions of the image. hp = impixelinfo(); % Set up status line to see values when you mouse over the image. % Enlarge figure to full screen. % Get rid of tool bar and pulldown menus that are along top of figure. % Give a name to the title bar. % Get the convex hull to get rid of boundary noise (wiggles). % Display the mask image. % Measure sizes of blobs. % Remove blobs touching border because we assume license plate will be in the field of view, not off of it. % Measure bounding boxes of blobs. % Take only thos where aspect ratio in in the right range - around 2 so in the range 1.5 - 3. % Mask the image using bsxfun() function to multiply the mask by each channel individually. %createMask Threshold RGB image using auto-generated code from colorThresholder app. % original RGB images is returned in maskedRGBImage. Function definitions are not permitted in this context. as the first line, and get rid of the final "end" at the last line. Or else put the function createMask() into a separate m-file, createMask.m, as the test harness code at the beginning. i was using 2016,after installing 2017 it's working well. Thank you Sir. What should I do for character segmentation, as all the characters are written in Bengali language. can you please give me any code of the character segmantation of bengali characters? I'm a beginner in matlab coding,so it's quite difficult for me to write the whole in this short time,day after tomorrow is my deadline for submitting character segmantation part in the university. It would be very much helpful,if you can provide any,which will only extract the characters of the above image. I do not have that code. I cannot even read Bengali, so I have no reason to have the code. Character segmentation is just identifying blobs where the character is (like thresholding). It is different than "character recognition" which determines which letter of the alphabet is represented by that blob. For your assignment, are you allowed to just hand in code that someone gives you? Aren't you supposed to code it up yourself??? Did the assignment say "Segment the characters", "Recognize the characters" or "ask someone for their code so you can turn in their code"? no,there is no problem with other's code, i must submit the reference from where i take it. Then I have to understand the code by myself and then brief him about it. It's actually charactar recognition, i have to show the charachters on the number plate in notepad of the car's picture. OK, good luck. You should probably start by emailing the authors in the link I gave to see if any of them will give you MATLAB code for free. Good luck.